This month's issue of AR Journal of Architecture and Urbanism features "Two Projects by AN.ONYMOUS." Focusing on a number of successful international competitions, the journal includes AN.ONYMOUS EX.TERRA and DE.MARCATION projects in the urban design section of the issue. The bi-annual journal is published in both English and Persian. Daily Bruin goes behind the scenes of the think tank-style final for 'the Prosthetic Seminar: Architectural Probes, Cyborgs and Cybernetic Environments.' Taught by AN.ONYMOUS principals, Marta Nowak and Iman Ansari, during the fall 2015 at UCLA, the Prosthetic Seminar took the human body as a 'site' for a series of architectural objects that would enhance or transcend basic biological functions. Sneak peak of students' work in "Prosthetic Seminar: Architectural Probes, Cyborgs, and Cybernetic Environments" at UCLA, taught by Marta Nowak and Iman Ansari. AN.ONYMOUS Principal Marta Nowak speaks to CNN producer Rachel Crane about the Hyperloop project at UCLA. Watch the video here. Popular Science magazine publishes an article about the Hyperloop project, featured on the magazine's cover, with an extensive commentary by AN.ONYMOUS Principal Marta Nowak. Read it online here. AN.ONYMOUS Opens a new office in Tehran. More information here. AN.ONYMOUS Principal Iman Ansari's essay "Who Killed the Narrator?" is published in April issue of AR Journal. The short essay analyzes the work of Bernard Tschumi work in relation to ideas of narrative and narrator in cinema and specifically Film Noir of the 1940's and 1950's. The Hyperloop studio, taught by AN.ONYMOUS principal Marta Nowak, along with Craig Hodgetts and David Ross is featured in UCLA Daily Bruins. The article showcases the work of students throughout the one-year Suprastudio program. AN.ONYMOUS Principal Marta Nowak is featured in article written about Hyperloop project in Design Trend. Marta is currently teaching a graduate architectural design studio on development of Hyperloop project--a high-speed transportation system--at UCLA. Marta is also consulting with Hyperloop Transportation Technologies on the realization of the project. AN.ONYMOUS Principal Iman Ansari will be speaking at Contemporary Architecture Conference in Shiraz on Wednesday December 17th, 2014. For more information about the conference please visit here. 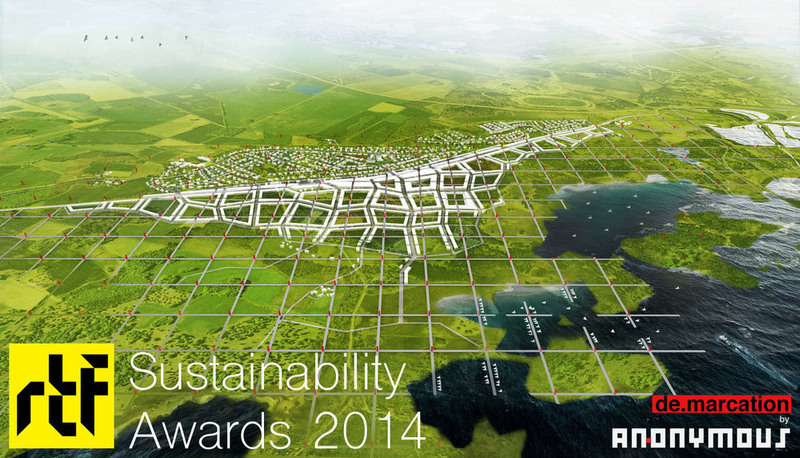 DE.MARCATION project receives Honorable Mention in Urban Design category of Rethinking The Future Sustainability Award. The award is designed "to develop an architectural language that would ‘sustain’ and ‘survive’ the impacts of new age challenges, and evolve into an architectural language of the future – taking sustainability one step ahead." More info on AN.ONYMOUS entry can be found on RTF website, or on DE.MARCATION. We just reached 1,000 likes on our Facebook page. Thank you all for your support! Material selection for LES.JUMELLES project on site in Paris, France. The project is a 300 sqm addition to a historic brick building at the heart of Paris, France. More news to follow! 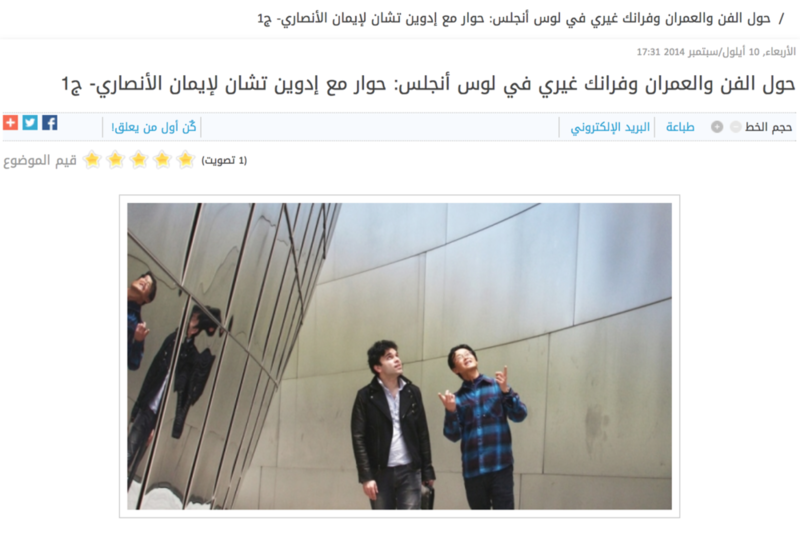 Iman Ansari's conversation with Edwin Chan is translated to Arabic in arch-news.net. The discussion was originally published in Metropolis Magazine's Point of View. The conversation reviews Gehry's work in the context of Los Angeles, and and traces the larger ambitions of the projects in his interest in art. Read it in English on Metropolis. AN.ONYMOUS project LES.JUMELLES is submitted to the City of Paris for building permit, and has moved to the next phase of development. The project is a 300 sqm addition to a historic brick building at the heart of Paris, France. More news to follow! AN.ONYMOUS in collaboration with Banamid organizes a conference on the work of Peter Eisenman in Tehran, Iran. The conference, titled “From Autonomy to Automation: The Work of Peter Eisenman” will focus on the defining legacy of Peter Eisenman spanning across 50 years of his intellectual and professional body of work. The conference will trace the evolution of Eisenman’s work over time and will examine its imprint on the contemporary discourse of architecture. “From Autonomy to Automation” is organized in three main sessions: Autonomy (1968-1978), Archeology (1978-1988), and Automation (1988-present), corresponding to the three stages of Eisenman’s work. Each session would begin with an introductory talk by one of the conference speakers and will follow a response by Peter Eisenman. The Speakers will include Peter Eisenman, Cynthia Davidson, Meghdad Sharif, as well as AN.ONYMOUS principals Iman Ansari and Marta Nowak. The Conference will take place on May 13-14, 2014 in the International Conference Center in Milad Tower in Tehran. The event is open to public to stimulate critical dialogues amongst participants, and instigate a broader discussion about the state of contemporary architecture in Iran. Conference organizers also anticipate that this event would promote intellectual and cross-cultural exchange between Iran and the rest of the world. For more information about the event and registration please visit here. AN.ONYMOUS Founder Iman Ansari will be speaking at University of Nevada in Las Vegas on March 24th, 2014 at 5:00 PM Pacific time. More information on UNLV's website here. Jasne ze Czestochowa publishes an exclusive interview with Marta Nowak in their December issue. The interview discusses Marta's achievements, the vision of AN.ONYMOUS, and some of the projects. Read the issue online here. Marta Nowak's discussion with Denise Scott Brown published in December issue of Architektura i Biznes. More info here. Iman Ansari's discussion with Bernard Tschumi is published in Hamshahri Architecture's special issue dedicated to Bernard Tschumi. The discussion, "Autonomy of Form, Anatomy of Program," analyzes Tschumi's recent built projects in light of his early theoretical work.